Ahead of the launch of Apple Pay tomorrow, The Wall Street Journal has posted an overview of the mobile payments service with some insight from Apple about what it expects from it over the coming months. Apple's Senior Vice President of Internet Software and Services Eddy Cue stated that he expects the biggest share of early Apple Pay transactions to be made up by in-app purchases. With Apple Pay, users will be able to simply use the Touch ID fingerprint sensor on a device to complete a purchase for an item or service in an app. The Touch ID fingerprint sensor will also still continue to work for purchasing apps from the App Store. "We’re trying to do something that I think is a game changer and it requires a lot of people to play together,” said Eddy Cue , Apple’s senior vice president in charge of Internet software and services, in an interview. “There’s a lot to do here and we have a lot of work to do, but it should be huge." While the company's mobile payments solution will also allow shoppers to physically buy items in-store using their iPhones, many of Apple's partners have yet to receive the payment terminals needed to process transactions. However, Apple expects many merchants to upgrade their terminals in the next year which will help the service. Apple Pay will not be compatible with corporate credit cards, prepaid cards, or even store cards like Macy's popular credit card offering. 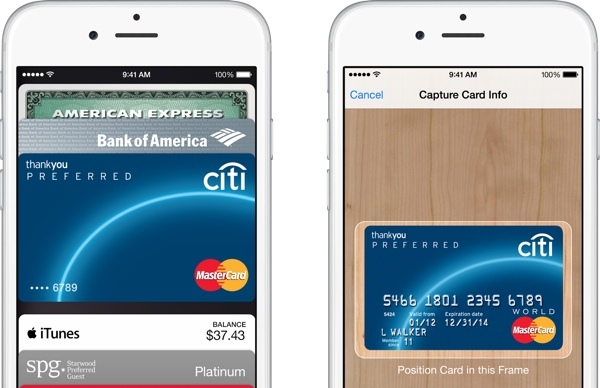 Macy's spokesman Jim Sluzewski stated that he expects Apple to add support for the Macy's card eventually. The article also notes that Apple Pay on the iPad Air 2 and iPad mini 3 will only be compatible with in-app purchases and cannot be used to purchase items in-store. This is likely due to their lack of an near-field communication (NFC) antenna, which is what the iPhone 6 and iPhone 6 Plus use to interact with compatible payment terminals. The Apple Watch will have an NFC chip when it launches early next year and will allow users to make in-store Apple Pay transactions. A report from Digiday also claims that Apple will integrate Apple Pay with its iAd business, citing sources familiar with the matter. The move would allow advertisers to embed a "tap-to-buy" button in their mobile ads, and would be similar to what Facebook and Twitter did for their services earlier this year. Apple is also said to be working in iAd's new retargeting feature with Apple Pay, which would allow retailers to push targeted ads with buy buttons to users. 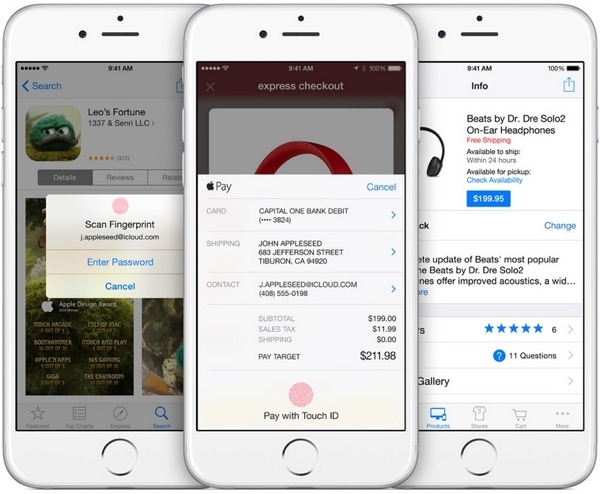 Apple is expected to integrate Apple Pay with iAd by the end of this year. Apple Pay will be launching tomorrow, October 20 alongside iOS 8.1 and will be compatible with credit cards and debit cards from major payment networks including American Express, MasterCard, and Visa. Several banks including Wells Fargo, Bank of America, Capital One and more are also listed as partners. In-store payments with Apple Pay will require the iPhone 6 or iPhone 6 Plus, and will also be supported by the Apple Watch when it launches in early 2015. All three aforementioned devices plus the iPhone 5s, iPad Air 2, and iPad mini 3 will be able to make online purchases with Apple Pay. So no iPad Air 1 support? Why would you even think :apple:Pay would be supported by the iPad Air 1 in the first place? It does not have TouchID. Nope. No Touch ID (no NFC either). What about people who buy their items metaphysically? So far Apple Pay is US only, I wonder if, and when, Apple will expand outside the US. The US is definitely the low hanging fruit of electronic payments, almost all of the rest of the world has had chip and pin and NFC cards for years now. Here in Africa we still trade with chickens, goats and the occasional woman or two if you want something expensive. I had to trade one of my wives and a daughter for my iMac, over here the concept of virtual payment is at least another 50 years away. I don't really understand why in-app purchases are Apple Pay. I mean...haven't we already been using these the same way since Touch ID showed up? No NFC involved...I don't know, it's weird, seems like they are just trying to juice up numbers that count as Apple Pay for something that really isn't that. Trying to end the murderous task of filling out the billing address on a mobile device. Bitcoin is rubbish. People spend lots of money on electricity and for some reason that is supposed to create a currency. Utter nonsense. Children + touch ID + in-apply purchase = ? I hope Apple has considered this situation. Do your kids have the same fingerprint as you do? You know, Touch ID doesn't work with just _any_ finger, it has to be the finger that is registered to allow payments. If you allow your kids to make payments with their fingerprints, then you deserve any purchase they make.